Welcome to the International Pentecostal Holiness Church! The IPHC is a global movement of disciples of Jesus Christ in 95 nations with 1,500,000 members and over 1,600 IPHC congregations in the United States. To find a congregation near you, please use the link Find An IPHC Church which will connect you to the conference office of a selected geographic area. IPHC has important affiliations with the Wesleyan Methodist Church of Brazil. We are also members of the National Association of Evangelicals, Pentecostal and Charismatic Churches of North America, Christian Churches Together, Empowered 21, National Hispanic Christian Leadership Conference, and the Billion Soul Network. The largest IPHC in the world is Redemption World Outreach Center in Greenville, South Carolina, led by Apostle Ron Carpenter, Jr. The largest IPHC outside the USA is the Wing Kwong PHC in Hong Kong, led by Field Superintendent Donavan Ng and Pastor Joanne Wong. While we rejoice at the work of the Holy Spirit through church history, the IPHC was birthed in the theological heritage of the Protestant Reformation and the emphasis of Martin Luther on justification by faith alone, the supremacy of Scripture, and the priesthood of all believers. We are also influenced by the holiness emphasis of the Anglican priest John Wesley. Our theological framework reflects Wesleyan holiness and Wesley’s understanding of the Thirty-nine Articles of the Church of England. Following the Azusa Street revival in Los Angeles, California, in 1906, the message spread around the world of the Pentecostal baptism with the Holy Spirit. This dynamic understanding of Acts 2 and all the gifts of the Spirit being available for the church today was received by the church and has characterized our life of worship of God, mission to the world, service to others, and fellowship with Christ’s church. Many of us who were reared in the church learned the “Five Cardinal Doctrines” of the IPHC: 1) Justified by faith in Jesus Christ; 2) Sanctification as a second, definite work of grace through Christ; 3) The Pentecostal baptism with the Holy Spirit with the initial evidence of speaking in other tongues; 4) Divine healing as provided in the atonement of Jesus Christ; and 5) the pre-millennial second coming of Jesus Christ. To learn more about our beliefs, we invite you to explore our website. Because of our Wesleyan and Methodist roots, local congregations are part of larger entities that are usually called “conferences.” Local congregations are led by pastors, and the conferences are led by a bishop. In a nation with several conferences, there is usually a presiding bishop over the entire national movement. Because the denomination began in the United States, every four years there is a General Conference where people are chosen to lead the USA IPHC and the Presiding Bishop of the global IPHC. The next General Conference will be 2021. Every four years the IPHC holds a Global Assembly where leaders from around the world gather for worship, prayer, vision-casting, and building relationships. The Fifth Global Assembly was held in Hong Kong. 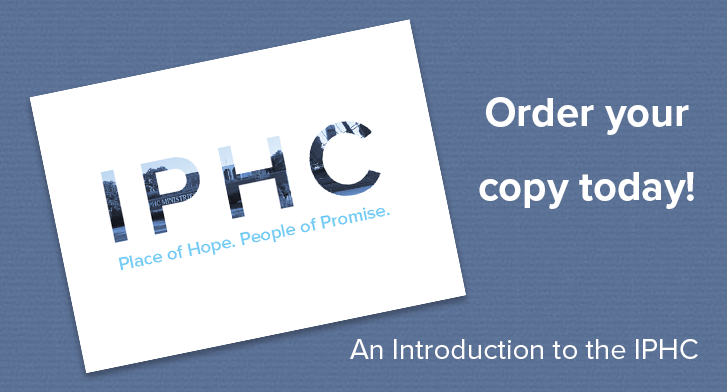 Based on Isaiah 54:2, 3, our vision is to be “A Place of Hope” and “A People of Promise.” More information about our Mission Statement, Core Values, and goals is also available on this site. Our heart is to plant congregations and share the good news of the gospel of Jesus Christ with every person in the world. We are called to share God’s love and the truth of His Word, the Holy Bible. We welcome you to explore these web pages, find a local congregation, and grow with us as we serve Jesus Christ!